The actor stepped out into the public spotlight for the first time since the Kristen Stewart cheating scandal, appearing in New York for 'The Daily Show' on Monday. 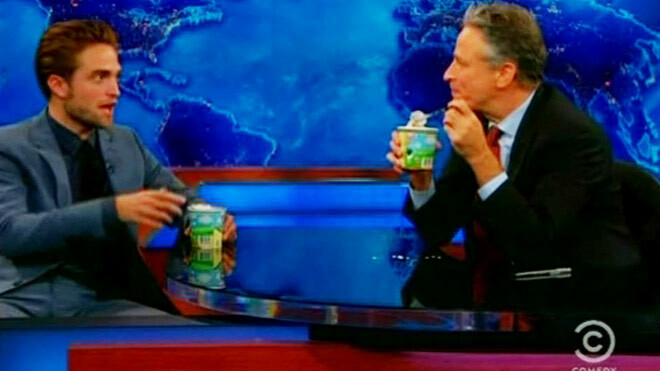 Host Jon Stewart offered the actor some Ben & Jerry's ice cream to help cheer him up, joking they were "just two gals" chatting about a breakup. Although Robert begged off any talk of his recent problems he agreed that for young people going through a breakup sometimes feels like the end of the world. He answered: "It is" and prompted the audience to respond "Awwwwwww." After the taping, he graced the red carpet at the Museum of Modern Art for his new movie 'Cosmopolis'. While signing autographs for fans, he told crowds: "Thank you, guys, for being here." The 26-year-old star had been keeping a low profile at Reese Witherspoon's Ojai, California estate. Robert has been described as devastated by the admission by Kristen that she cheated on him with her 'Snow White and the Huntsman' director, Rupert Sanders. The 22-year-old actress and the married Rupert have both issued public apologies.